One of the worst effects of Proportional Representation is the way it divides the country up into places where votes matter, and places where they do not. On the one hand, there are safe seats. There are so many of them that vast electoral deserts now extend across much of the UK - where little campaigning takes place and the outcome is a foregone conclusion. 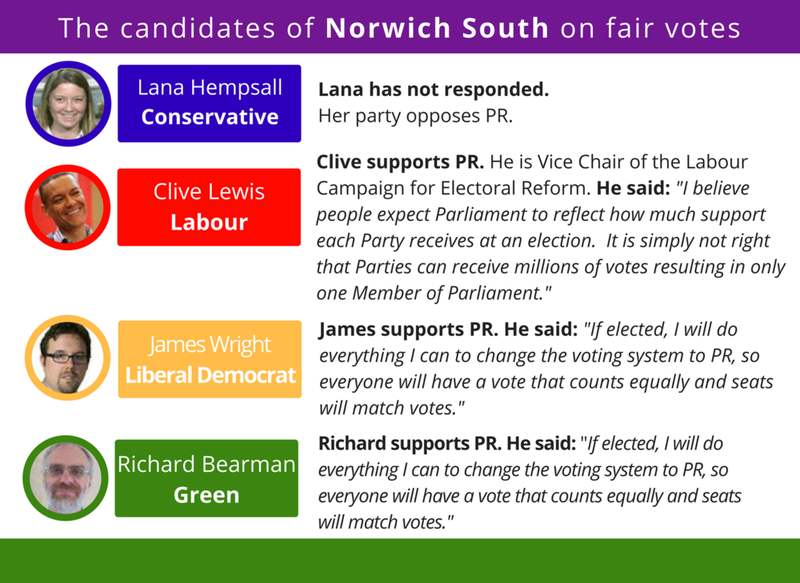 Of course, there are other candidates standing, and two of them are fiercely strong supporters of a fair voting system. But because of the unfair system we currently have, it will take an upset of historic proportions for either of them - or the voices of their voters - to make it to Parliament. Unfortunately for British democracy, most constituencies are safe seats - resulting in uncompetitive elections, inaccurate representation of the voters, and disillusionment with the democratic process. Bath is the luckiest constituency in the UK - the only one in which all the candidates are in favour of Proportional Representation. This includes Conservative incumbent, Ben Howlett. ...a little up the road, Bristol West is a rare "three-way progressive" marginal - with the Tories in 4th place in 2015 and a range of views on electoral reform to choose from. Ealing Central & Acton is an example of how tactical this election has become. In 2015, 9 candidates stood here. In 2017, it's dropped to just three - with both UKIP and the Greens standing down. 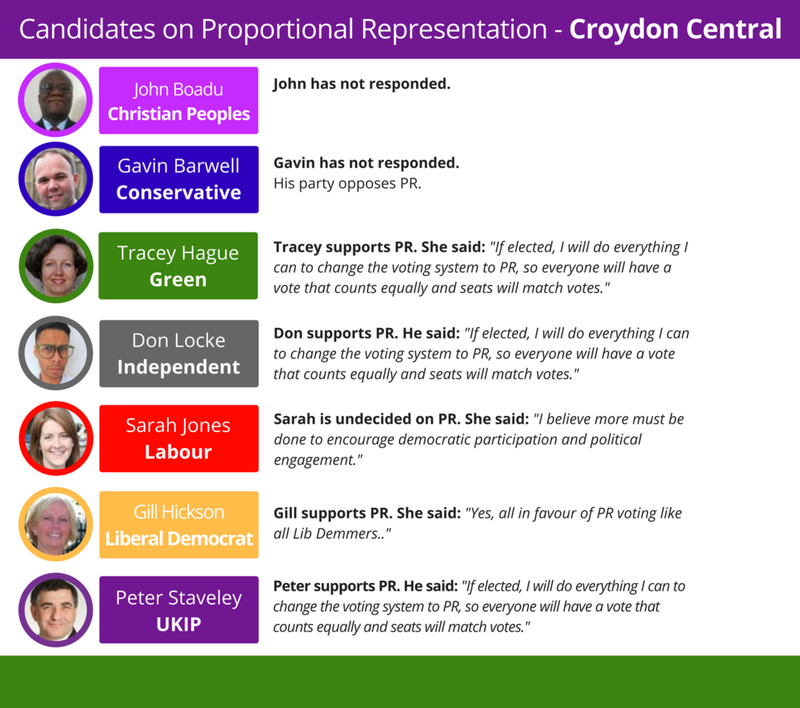 Meanwhile, Croydon Central has seven candidates standing. With a majority in 2015 of just 165 votes, vote splitting threatens to swing this winner-takes-all election one way or the other. Heading north, Cambridge could be a close race between electoral reformers. The anti-PR party in this constituency came a distant third last time around. Things are less certain in Norwich South, where UKIP stood down for the Tories. Ironically, this *could* mean an anti-PR MP is elected for a constituency in which the overwhelming majority want PR! 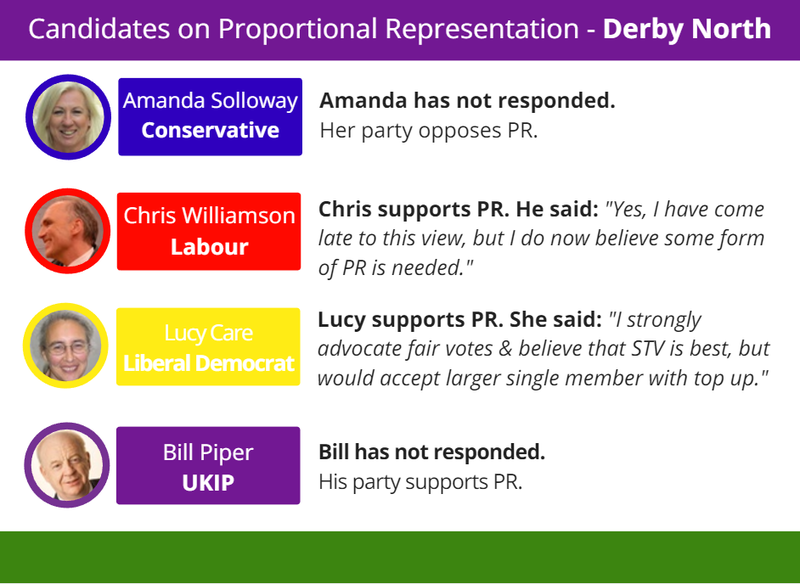 Derby North is another "progressive alliance". With just 41 votes between Labour and the Conservatives in 2015, the Greens have stood down. Because of FPTP, this could be the deciding factor. Although the City of Chester is extremely marginal, for First Past the Post it's a safe seat. The Labour incumbent sponsored legislation to extend the use of FPTP to all English elections last year. Finally, in Lancaster & Fleetwood, UKIP has withdrawn for the Conservatives and three pro-PR candidates risk losing the seat to the only anti-PR candidate among them. None of these constituencies are easy to predict - which is what makes them so rare among our Parliamentary constituencies. Their rarity in itself is a damning indictment of our broken voting system. But even in the marginals First Past the Post fails. In fact, it is here where votes are most valuable that tactical voting is most rational - in many of these constituencies the party you want to vote for may not be standing because of our voting system. And all too often a vote for the candidate you believe in is a vote that's thrown away. What we need is a voting system in which everyone can vote for whoever they believe in - a system of Proportional Representation - so everyone will have a vote that matters equally and seats will match votes.